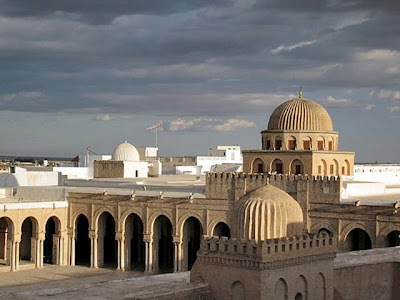 The Mosque of Uqba, also known as the Great Mosque of Kairouan, was built by the Arab general Uqba ibn Nafi in 670 AD. It covers an area of 9000 square metres. It is one of the oldest and largest mosques ever built and a cornerstone for Islamic faith and worship. It is located in the town of Kairouan, which itself is listed as an UNESCO World Heritage site. The mosque got it's present look during the 9 century, after several huge reconstructions and add-ons. It has a hypopstyle prayer hall, a vaste marble courtyard and a massive minat. The last restoration was done in 1967. Fave years later it opened up for the public once again.